If you’re in a contemplative mood and want to create a little corner of peace and tranquillity, you could do a lot worse than to light a few candles and give Mary Hopkin’s Spirit a spin. Reissued on her own label under the guidance of daughter Jessica Lee Morgan, this 1989 album offers an intimate and deeply personal insight into the early influences that coaxed Hopkin into her singing career. So intimate, in fact, that you occasionally feel that you are eavesdropping on private thoughts about her Welsh childhood. That is the charm of Spirit. In a new note for the album, Hopkin states candidly, “No aspiration to classical accuracy here… just me and my memories.” So classical purists probably need proceed no further. But they’d really be missing the point if they started grumbling. Mary Hopkin is no pop star trying to be an opera star. Her Introit and Kyrie from Fauré’s Requiem are honest, unfussy interpretations. “One Fine Day” from Madam Butterfly, sung in English, is a clear and touching narrative which eschews the potential for overblown drama and actually allows you to hear the thoughts of the tragic heroine – although there is one slightly tricky moment when the keyboards evoke a Hammond organ at its most tremulous. And there is an ethereal “Intermezzo” from Cavalleria Rusticana, which confirms the fact that Hopkin always had one of the sweetest voices of any popular female British singer. Mozart’s “Ave Verum-Corpus”, the sentimental parlour song “Sweet and Low” and a soaring “Ave Maria” evoke the childish innocence that must have informed those early performances at chapel or in the school choir. Two composers’ takes on Pie Jesu are offered. Andrew Lloyd Webber’s – the only contemporary offering – recovers much of the dignity it has lost over the years at the hands of over-hyped juvenile stars, while Hopkin’s crystalline soprano weaves a moving threnody with Fauré’s version. But the highlight of the album is a delightful, folk-ish interpretation of “Jerusalem” that allows you to hear the beauty and strength of Blake’s words in a way that is the antithesis of the hearty tub-thumping treatment it usually receives. 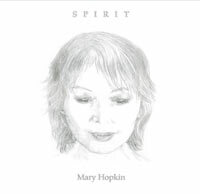 Following the success of her recent release, You Look Familiar, which was written and produced with son Morgan Visconti, Spirit is a touching reminder of the range and depth of Mary Hopkin’s singing talent. It’s great to see her back catalogue being made available while we look forward to the possibilities of new work.